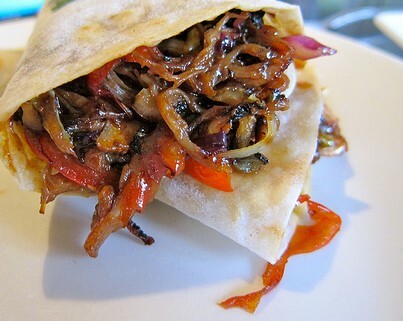 Sweet and spicy pork with sauteed veggies and a crisp tortilla! Combine pork, soy sauce, and garlic. Mix well. Coat a wok or large nonstick skillet with cooking spray; drizzle oil around top of wok, coating sides. Stir-fry for 5 minutes or until browned. Add cabbage, mushrooms, and pepper to wok. Fry for a few minutes. Set aside. Add sprouts and onions and a little more oil if you need it. Fry for a few minutes. Return pork mixture to wok. Add the hoisin sauce and stir-fry 2 minutes or until thickened. Spread 1½ teaspoons plum sauce over one side of each tortilla; top evenly with pork mixture. Heat tortillas in a microwave for 35 seconds. For a crispy tortilla, bake in the oven/toaster oven until slightly golden and crispy.